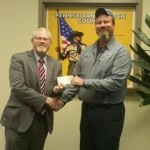 The Cope Company Salt, Lancaster, donated $2000 to Boy Scouts of America, Pennsylvania Dutch Council which serves Lancaster and Lebanon Counties. Cope Salt regularly gives money to local non-profits as part of their In the Community program. The Boy Scouts were chosen because of their history of service and youth development with an emphasis on ethics, leadership and citizenship. Making the presentation was Cope Salt employee Charles Snyder who achieved the rank of Eagle Scout with Troop 73, Ephrata in 1990. Duane Crouse, Development Director, represented the Boy Scouts. The Cope Company Salt is the largest distributor of salt products in the tri-state area and stocks a broad assortment of water conditioning, ice melt, solar salt, and pool salt products. They also manufacture a patented automatic brine maker, the AUTOBrine®.